Sierra Leone has ordered the quarantine of over a million more people in different areas to contain the deadly Ebola virus. In a nationally televised address on Wednesday, President Ernest Bai Koroma announced that the quarantine “with immediate effect” was ordered in three districts and 12 tribal chiefdoms. He said the order takes effect in the southern district of Moyamba as well as the northern districts of Port Loko and Bombali, sealing off around 1.2 million people in the West African country. 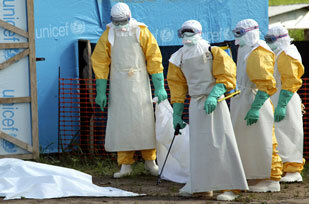 The announcement comes a month after the quarantine of communities in eastern districts of Kenema and Kailahun. The recent lockdown in West Africa now affects more than a third of the country’s six million population. “The isolation of districts and chiefdoms will definitely pose great difficulty but the lives of everyone and the survival of our country takes precedence over these difficulties,” Koroma said. “These are trying moments for everyone in the country,” he added. Health professionals and critics of the controversial lockdown say it was a poorly planned publicity stunt since health professionals were not trained properly. Health organizations say the deadliest Ebola epidemic on record has infected almost 6,000 people in Sierra Leone and neighboring Liberia and Guinea, killing nearly half of them. In Sierra Leone alone, the epidemic has claimed nearly 600 lives, they say. Ebola is a form of hemorrhagic fever whose symptoms are diarrhea, vomiting and bleeding. The virus spreads through direct contact with infected blood, feces or sweat. It can be also spread through sexual contact or the unprotected handling of contaminated corpses.